Hooked it up and tested in Chilipeppr...work beautifully the first time! Well I tried to restart the Aztec file last night after I edited out the portion that had already cut. And it not go as planned (shocking I know). So I guess I will start over this weekend. It started out really well, ran for about two minutes cutting right where it had left off. Then it lost the position and went nuts. The good news is that I was able to set a personal best time for hitting the e-stop! So nothing was damaged. I wonder if it is possible to have Vcarve generate the gcode in two parts so the file is not so large. Maybe I can select the bottom half of the vectors for one tool path and the top half of the vectors for a second tool path. Sorry it didn't work. I've had issues with UGS the last few cuts so I switched to Chilipeppr. I like it much better. No issues with the Z Axis touch plate (although I've read you can make it work with UGS). I prefer the interface. Made these to hang under the mailbox. Didn't want to mess with 2 sided milling yet, so I made two out of half inch pine and I will glue them together, paint and clear coat. I used a 1/8th inch endmill at 100 ipm, plunge of 30 ipm and did the pocket 0.2 inches deep in 2 passes. It probably would have worked with 1 pass, but who knows. The cutout was with the same bit (I combined the toolpaths into 1 file) and did 4 passes to cut it out leaving tabs (1 on each side). I'll do a quick sand before I paint. Very nice! I have not tried a feedrate over 40ipm, did you get much chatter? Not much at all, bear in mind I am using the Dewalt DWP611 as my spindle (router), so a lot more power. I am glad you mentioned that. I will just keep my little 300w spindle at a comfortable 30 ipm. 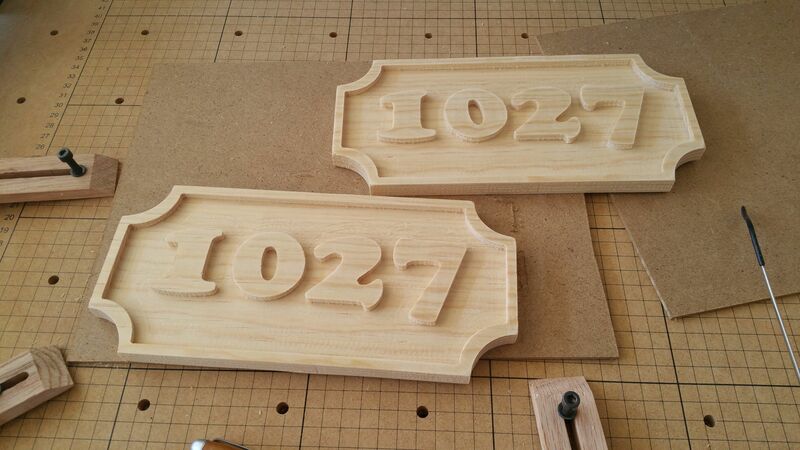 I do actually have a Dewalt 611 router that I purchased long before I ever heard of Inventables. But I have not tried to attach it to the X-Carve mainly because I really like the ER11 collet. 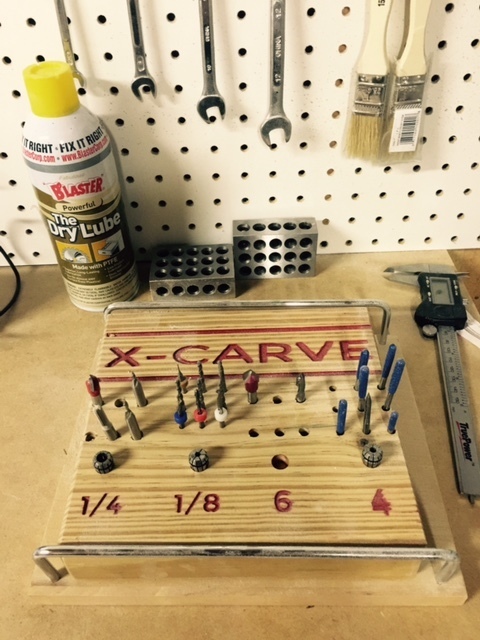 I am able to easily use 1/4, 1/8, 6mm, 4mm shank size bits with no trouble. The last time I looked a 1/4 inch collet for the Dewalt was crazy expensive and a pain to swap out (compared to the ER11). I also really like the very nice barrel type mount for the 300w spindle. I originally was using the ring type holders with the SO2 and keeping everything aligned was a real pain. What has been your experience with the Dewalt collet and mounting system? Here is a new thought. Vcarve will allow tiling of a project, I wonder if I could break the Aztec vectors into two tiles with both tiles having the same zero location (so I don't need to move the work)? Does anyone have experience using the tile feature of Vcarve desktop? I like the setup, I got the mount from Inventables so it functions the same as the spindle mount...I have both, never attached the default spindle...upgraded before my X-Carve ever showed up. 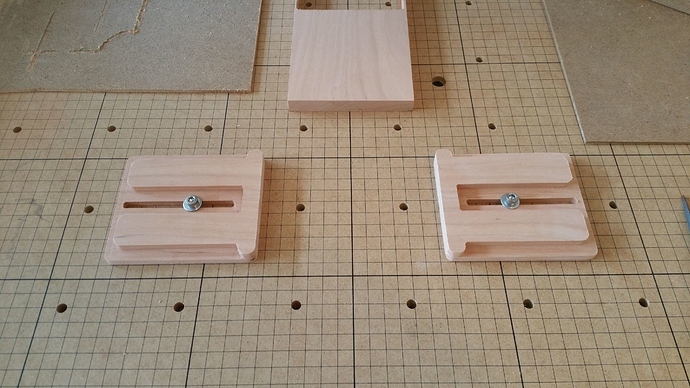 I have tons of 1/4" and 1/8th inch bits (I built a smaller machine a few years ago) The 1/4" bits go straight into the router and I use an adapter for the 1/8th inch bits (the RotoZip Chuck Adapter Kit). Works great. I've never used the tiling feature. Instead of Tiling, you could go into V-Carve, split the vectors up onto different layers...maybe put the center ring and contents on one layer...the middle ring and contents on another layer and then the outer ring and contents on a third layer. Generate toolpaths by layer and split it into thirds. Just make sure the V-carve of all three layers look right in the preview. That way you can do it in more manageable chunks. I'm actually waiting for my DeWalt mount to show up right now, @ErikJenkins. I ordered mine with the stock mount, and it's not bad, but the power for V-carving, etc, would be really nice. Plus, I've already got a 611 that I've been using for quite a while as a palm router. I might end up with another one at some point, if this works out well. use the rectangle tool as much as you can...select a bunch...right click...select move to layer...you can also hold the shift key down to individually select vectors....there are a lot of vectors...it will take a few minutes. I played with the tiling feature and like everything else with Vcarve it is super easy and does exactly what I needed. Just told it to break the job into two parts and it did, even asks if I would like any overlap between them. Very nice to hear. I may need it someday. Made a couple of clamps out of 1/2" cherry I had in the shop. I'll make a couple more later. I used a 1/8th inch endmill with 40ipm and a plunge of 20ipm. I saw a video on Youtube and made my own. 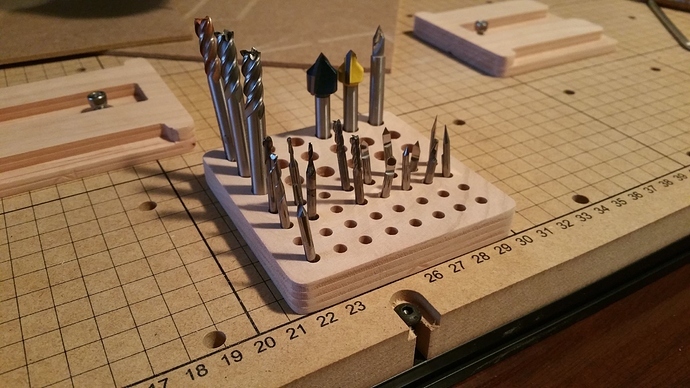 Since I had the 1/2" cherry scraps out, I made a little bit holder for 1/8 and 1/4 inch bits.
. Mine is from an old 2x8. I should break out one of my tiny v-bits and label everything. I like yours.